Join the Twin Cities local and international communities in Brit’s Clubhouse Room for live music, a color guard and words honoring global veterans on the 100th anniversary of the Armistice that ended World War I. Doors Open at 12 Noon; Program 1–3:30 p.m.
Scott McGaugh, the author of Honor Before Glory, will discuss the World War II story of the Japanese American GIs of the 442nd Regimental Combat Team who rescued two hundred American soldiers who were surrounded by German troops in the Vosges Mountains of eastern France. The 442nd was composed of two distinct units: the 442nd Regimental Combat Team and the 100th Infantry Battalion. These two units were formed independently at different times and did not share a common lineage. The 100th would eventually become the 1st Battalion of the 442nd in June 1944. 2018-2019 SCHEDULE IS POSTED as of 19JUL2018 Click here to see the schedule for our 32nd season! 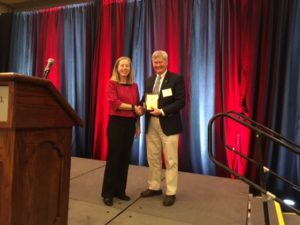 Our very own Dr. Joseph C. Fitzharris, Professor Emeritus of History, University of St. Thomas, received the 2018 Edwin H. Simmons Award from the Society for Military History. The Edwin H. Simmons Award (formerly the Victor Gondos Award) is presented for long, distinguished or particularly outstanding service to the Society for Military History. Established in 1933 as the American Military History Foundation, renamed in 1939 the American Military Institute, and renamed again in 1990 the Society for Military History, the Society is devoted to stimulating and advancing the study of military history. Its membership (today more than 2700) has included many of the world’s most prominent scholars, soldiers, and citizens interested in military history. 2017-2018 SCHEDULE IS POSTED as of 8/12/2017 Click here to see the schedule for our upcoming season! See flyer for the program. Filled with hope, humanity and humor, Wiesenthal is the riveting true story of Simon Wiesenthal, an ordinary man who did extraordinary things. Nicknamed the “Jewish James Bond,” he devoted his life to bringing more than 1,100 Nazi war criminals to justice. Intelligent, funny, flawed and noble, Wiesenthal was a universal hero. His unbelievable dedication and tenacity over decades is honored in this play, which gives equal weight to his wisdom and wit during his long, purposeful life. Tony Award winner Daryl Roth and Karyl Lynn Burns present the New York premiere of Wiesenthal, the award-winning play written by and starring Tom Dugan. We are grateful for the Sponsorship of JCRC to support this production. The Japanese American Citizens League is organizing a program to commemorate FDR’s Executive Order 9066 that incarcerated Japanese-American Citizens.